stumbles and stitches is a brand new blog by my friends angel and jenny! they met and became friends right here in nashville and then jenny moved all the way across the continent to live in a trendy, far off land called seattle. so to stay in touch crafty-wise they started a blog and we get to eavesdrop on the conversation! this towel rug that angel made is already on my to-do list, and do not miss the spectacular star wars puppets that jenny made for angel's son! what i really love about this blog is that it truly is a conversation, between two women i truly admire and respect, not only for their creativity but also for their mothering, their wifery, and their gentle, good spirits. please drop in on them and stay a while, and leave them a comment or two so they'll know you were there! i haven't done this in a while. :) tonight we're going to the circus, which made me think of some quirky, eccentric websites i like to visit--some for inspiration, some for recreation, some for meditation. today i spent my time at fed by birds . i think this site is an online archive for a store--the "about" blurb says "south london haven"--but whatever it is, they have some amazing finds that never fail to surprise or intrigue me. i originally found fed by birds while looking for pictures of a calash. then i found the pictures of one of my favorite dance figures, ruth st. denis. and then i found the knitting. and the shop windows. and THEN i found the waterbugs. and THEN i found the postcards. and THEN i found the books. oh my gosh, the books. the estonian schoolbooks, and alice the flapper, and books from the time when a book was an object of art to admire and cherish. there is simply too much on this site to see at one time, but that just leaves you something to look forward to on your next visit. if you're lucky, you'll get snowed in this weekend and have plenty of time to browse. we lost our network thursday so this week's friday favorites are a day late. tomorrow is mother's day in america (and apparently in lots of other countries too), so what better time to feature like mother, like daughter, a team blog written by a mother, her four daughters, and their grandmother. like mother, like daughter is a place where you can learn to make a new lining for your leather gloves, convert a clementine box into a storage unit, or just partake of their collective, multi-generational wisdom. just look at this beautiful room! check out the frugal gardening! and do not miss all the lovely, lovely quilts! i wish a very happy mother's day to each and every mother, wherever you are--may it be the best mother's day yet! *do you have or know of a site that deserves to be featured? post the link in the comments and i will make sure to include it in a future friday favorite! sunday shout outs are now friday favorites! when i started doing sunday shout outs it was to give props to all the fabulous readers and other bloggers who offer us all so much on the web, but since sunday shout outs sometimes get lost in the weekend rush, i've decided to post shout outs on fridays instead. and instead of shout outs to three sites, i'm going to limit the shout out to just one featured blogger, because each shout out is really worthy of quite a bit more attention than just one little paragraph. and since friday doesn't start with an S, i'll now call it "friday favorites". and the first friday favorite is su of vively online. i found su from a project she posted on the wardrobe refashion blog . in her bio, su says, "i'm no expert", but you'd never know that from looking at all her fantastic projects. as of this writing, on the front page of vively online there are two adorable dresses she made for her adorable little girl, two fun and fabulous tops she made for herself, and a gorgeous dress she models with great style. she also has a collection of free tutorials, one of which is going on my stash reduction list: this casserole carrier which will be perfect for taking dinners to new mamas! su also has an etsy store where she sells vintage and retro patterns for amazing bargain prices. please find some time this weekend to visit vively online, and be sure to leave her some comment love. do you have or know of a site that deserves to be featured? post the link in the comments and i will make sure to include it in a future friday favorite! this little portable cardboard art studio is just the thing for my little artist on the go! this project is an older post from maya*made, a blog i used to read all the time but lost when i changed computers. (i know, that is lame.) anyway, maya*made is such a pretty blog that you should set aside some time just to browse around it. filth wizardry is full of great ideas for projects to do with the kids, the one that is currently on my list is the cardboard pizza--this will be perfect for helping ella with her fractions! do you know of a site that deserves a shout out? post the link in the comments and i will make sure to include it in a future sunday shout out! sew retro is a group i keep thinking i'll join, except that i know i'd let them down by not posting enough. :D the members of this group produce some terrific projects and creations, and if you are obssessed with vintage and retro patterns, this is the group for you. ikat bag is a new-to-me blog that i will be visiting often. the foam and felt cake is spectacular! i've been buying patterns from emailed vintage patterns ever since i found her on ebay a few years ago. 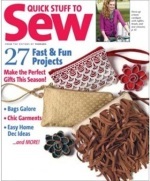 she offers instant PDF downloads of retro/vintage patterns and craft books, and for every two patterns/books you buy, you get your choice of a third FREE! the files are excellent, and all are within the public domain but are so rare that her efforts in preservation are a unique and valuable service. my friend becky makes lovely lovely jewelry and i am now the proud owner of some lovely lovely earrings that make me feel lovely lovely. thank you, becky! becky's etsy shop is rejardin, a place where you too can get some lovely lovely things but beware, you will have to race me for anything in the red/orange/yellow/pink/green family (you can have all of the blue stuff). coughing and shouting and sewing, oh my! woohoo to all the new convertible dress flickr groupies! thank you all for joining. basimah gets the first shout out of the day, she posted a picture of her infinity dress, which she made out of a bed sheet! i love the way she wrapped it--it is flattering, interesting, and modest. plus i LOVE the color--i had no idea they sold eggplant bed sheets! then go check out the oo-la-la halter swing dress that rebexi shared with us today!!! the fabric is beautiful and so is she. and finally, i sewed. since today was the first day of autumn, i decided to make a new purse. ok, it wasn't really because its the first day of autumn, it was because i found a piece of vinyl in the shop and i wanted to use it up. ok, it wasn't really because i found the vinyl, it was because i found this pattern a few days ago and immediately became obessed with it and then i found the vinyl. if i had just followed the instructions, i would have been done in about 30 minutes. as it was, i changed so much of it that it took over an hour but in the end i really like it. this will probably be my quickie gift of choice for a while--it takes very little in materials, very little in time (even with all my changes), and it looks impressively complicated. 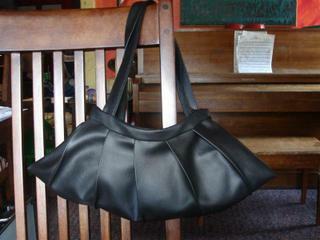 what i changed: i cut the body of the bag shorter--i cut the straps longer--and i made a band at the top. i think it probably needs some kind of closure but i haven't decided what it would be yet. its just big enough to hold what i usually carry, and it smells like a new car. well, no post yesterday so i'll make up for it with two posts today. let me start with shout outs, i want to welcome the new crop of members to the flickr convertible dress group! i'm so excited to have so many companions. harmonyluvsisketch has added pictures of her GORGEOUS dress to the group photo pool--run, do not walk, to see it. the color is just so lovely and the way she wrapped it is too. also, bienvenidos SarAmaRi! go check out her photo albums on colors--labeled in spanish which ella is thrilled about--the verde album stopped me in my tracks. then go visit swellanor's travel albums. but if you live within 100 miles of nashville, skip the winter album, you will be green with envy at all the SNOW. and now a pledge: i PROMISE to make a new convertible dress and/or top this week, and post pictures. who will join me?